We all are fascinated by the idea of Augmented Reality – the potential this technology has in several industries, the real time assistance in various field etc. We all love sports but witnessing a live game can be cumbersome especially with the limited view you have on one side of the stadium. The players on the field seem like minute objects and sometimes it becomes difficult to identify which player is involved in a particular game instance. Verizon seems to have an answer to all this cumbersome experience. The U.S. Patent Application No. 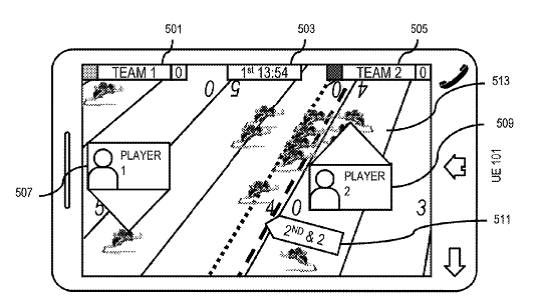 2016/0098860 titled ‘System and Method for Providing Live Augmented Reality Content’, describes the provision of a Mobile app which will enable the viewer to see identify and see real time statistics related to a particular player let’s say for an NFL game. The app will work by identifying sensors which can be embedded in Player’s sports equipment like Helmets. The augmented reality content which can be fetched from the players via these sensors can be the position of the player, the speed with which he is moving on field etc. The patent application does not limit to any particular sport and can be imagined in any number of sports. It can even aid the umpires and the referees in making certain on-field decisions and thus create a level playing field. I do not agree, I would like the actual feel of the game better. This can be a game changer. I would love to have this feature over an app while watching a game for my favorite NBA team Dallas Mavericks. Wouldn’t that be awesome. Mark Cuban would definitely agree with you on this.